Every month we see new women seeking help at our shelter, but we also have an ongoing waiting list. Almost all of the women have been victims of abuse, but with the help of our staff, they leave with a new relationship with God and a promising future. We will begin raising funds in 2019 to expand our Women’s Shelter from the present capacity of 25 to accommodate 50+ women and children. We are replacing our old, worn out buildings with a new 18,000 square feet building. This project is estimated to cost $3.2 million. We were blessed with an $800,000 estate gift and will be applying for a $1.5 million grant from Federal Home Loan Bank. In addition to those amounts, we will still need to raise another $1 million. 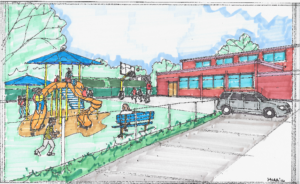 The Community Center renovations, set to begin in spring 2018, will include the addition of an outdoor playground. Expansion and renovation of our existing Youth Center and former printing company building will begin in the spring. We encountered a delay due to initial bids coming in too high, so the project is being re-bid this winter. The first step of the project will be raising the roof at the printing company building, creating a full-sized gym! We will also add space for classrooms and a connector to join the two buildings together. We will then move on to the next phase, renovating our existing building. The estimated cost for this project is $2.3 million. Thanks to you, our faithful donors, we’ve already raised $1.5 million, but we still have to raise approximately another $800,000 for completion. Although we are presently able to reach about 75 kids, these upgrades will give us the ability to reach 200+ children, teens and their families. 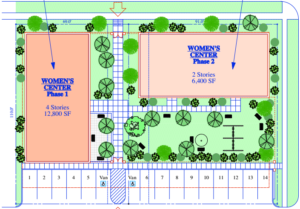 More details about the Community Center Building Project are available here. As with any other new year, 2018 promises to bring with it many challenges; but we can be sure those challenges will be accompanied with many blessings. Thank you for your support and we truly value your prayers as we move forward with God’s leading.